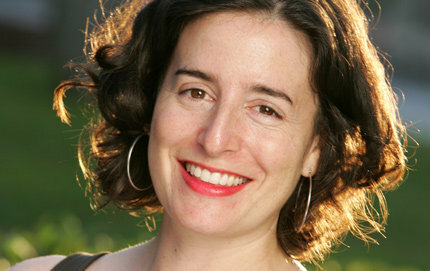 Aimee Bender is most recently the author of The Particular Sadness of Lemon Cake. She previously appeared on The Bat Segundo Show #16. Condition of Mr. Segundo: Feeling his inner cake and eating it too. Subjects Discussed: Fantasy and magical realism being contingent upon reader belief, domestic realism and fantasy, The Particular Sadness of Lemon Cake as a Los Angeles novel, foodies, apartment complexes in Southern California, high school reunions, sustaining fairytale magic in a longer work, how a shift in an author’s temperament affects a writing project over several years, positive pessimism, parallels between writing process and psychotherapy, Adam Phillips and boredom, the fine line between attention and concentration, staying put, believing in the details, Ursula K. Le Guin’s “Plausibility in Fantasy,” Murakami’s Kafka on the Shore, writers whose complete works you can’t read all at once, author doubt and faulty fiction premises, Kafka, early attempts and restarts on Particular Sadness, the dangers of ranting, the relationship between empathy and fantasy, reverse engineering the human relationship with food, Rose’s early form as an older man on the make for soup, MFK Fisher, the materialistic impulses of Rose’s parents, bottom-feeding consumerism and garage sales, the consumer as an eater of another kind, qualitative precision vs. quantitative precision, mathematics and fantasy, people who love making food, Cafe Gratitude, feeling simultaneously appreciative and cynical about hippie ideologies, grandmothers who send strange packages, Edward Hopper, fatalistic determinism, Hemingway’s iceberg theory, the visual advantages of not using quotes, Bender’s experience with chairs, the McSweeney’s logo, whether Hopper’s paintings are truly lonely, “The Lighthouse at Two Lights,” artists who don’t enjoy being photographed, whether movies are destroying imagination, shorter attention spans, memorizing poetry, Wallace Stevens, Don Marquis’s Archy and Mehitabel, Kay Ryan, students who can’t remember the questions they are about to ask, and whether or not the United States is presently suffering from a short attention span epidemic. Correspondent: We were just joking about this being a few years since we last talked. This leads me to ask: I know you to be an optimist, both in your previous books and in our previous conversation, which was quite jocular. But with this book, I almost get the sense that you’re exploring this positive pessimism with the Rose perspective. And I’m curious how much that may play into this. The idea of exploring a perspective that’s just a little different from your own. Or perhaps I have misjudged you and you have been a closet pessimist the entire time! Bender: Well, both! I think I’m both. So it’s both exploring a point of view that’s different from my own. But of course, for any of it to ring true, it has to ring true to me in some way as well. So I think that there’s something of that balance of seeing things cynically and seeing things hopefully. Depending on the day. Will it end in a different spot? But I guess I did feel really focused in this book maybe, in particular, about what would be burdensome for that character. And also what would be burdensome for the brother. And maybe the tone again of the magical quality about her and her brother feeling different. Like hers feeling dark and his feeling darker. I somehow think of them as triangles feeding into each other. Hers is the smaller shape and his is the darker shape in some way. Correspondent: But what do you do if you’re trying to channel this positive pessimism and you’re in an absolutely peppy mood that day? Because I think that of all your books, this is tonally very, very specific. And so what do you do to maintain that tone? Especially since it’s several years of trying to get this right. Bender: Exactly. Well, I have this kind of system that has worked for me so far, which is to write a couple hours in the morning. And the rule — a friend of mine from grad school named Phil Hayes said if you write what you’re interested in writing each day, writing will have life in it. Which is great. It seemed simple on the surface advice, but I think it’s pretty deep. Because the idea that each day, you can generate whatever is happening on that day — it means that on the optimistic days, I probably wasn’t working on that book. But the thing is getting a good work day in feels very optimistic and hopeful, even if the work itself is kind of dour and sad and bleak. A good work day feels so good no matter what. So there’s kind of a contrast there already. But let’s say I’m in a really upbeat mood and I just can’t get into the sadness of the book. Then I would work on a short story. So it was all very mood governed. But I think once there was enough material to work with, it didn’t feel sad to work on. It felt like explorative. Correspondent: Well, that’s interesting. Because I’ve always wanted to talk with you about the two hour session. Correspondent: Which sounds almost like expansive psychotherapy. Correspondent: But I understand, and I just want to get this totally clarified, you sit on the couch. Correspondent: You want to channel your mind into boredom. Correspondent: And I’m curious about this. It seems to me a more reasonable answer to, say, Jonathan Franzen blocking all sunlight from the room, which I think is really quite intense. I mean, I understand the need. Bender: And I think he has headphones. Correspondent: There are bats that fly in his cave. I don’t know. Correspondent: But the point is that your level of trying to remove yourself from distraction seems infinitely more reasonable. You’re in this fixed location. How do you will yourself into filtering these ideas? Or if you’re in a situation where you have so many ideas, so much information, so many emotions that you’re writing, that you just need to sit still in order to just access it during that two hour period? Bender: Yeah. I think you said it in an interesting way. “Channeling myself into boredom.” But it’s not. The boredom happens. Correspondent: (laughs) Oh come on. Bender: The boredom does not need to be channeled. You know, there are those people who say, “I never feel bored.” I’m definitely not one of those people. So in some way, for me, it feels like a dance between boredom and concentration. And I think my concentration can feel thin. So the idea is blocking out the amount of time so that I’m going to try to concentrate. But I don’t know that I will. And inevitably I get bored. And then hopefully on the other side of boredom is something. There’s this great quote by Adam Phillips, who is a British psychoanalyst. He talks about boredom as a waiting space and as this interim place for a kid where it’s not something to be filled or plugged in. It’s something actually to sit through. And that’s often where a kid will get really creative. And they’ll be like, “Okay, I’m bored. Now I’ve created this land under the kitchen sink.” Whatever. Correspondent: I use the term “channeling” or “willing yourself” into this concentrated focus. Is it a variation of the Flaubert maxim “Be calm and orderly in your life so you can be violent and original in your work”? Bender: There is something to that. I do believe very strongly that structure helps creativity and boundaries in that it is like a therapy hour. The boundaries of a time, a creative space where I can go to someplace that is potentially revolting to me and leave. And knowing that I will leave. There’s something very helpful about that. But still, it’s not even that I can focus myself into concentration. It’s just that the only rule I really have is that I have to stay put. And then they’ll be many, many bad days. Correspondent: So if you stay put, you can confront any emotion. It’s like running the gauntlet here. Bender: I think that if you stay put, stuff comes up. I think eventually stuff will bubble up and there will be things to write about. But it’s not as if I bravely have the sword in hand and I’m rushing forward into the forest. Bender: I’m sitting there feeling like I want to get up. I want to get up. I want to get up. And the only weapon I have is stay put. Correspondent: Got it. Is it a matter of ADD or distraction? Or what? Bender: It’s not ADD. But I just do feel easily distracted. There are other writers who will say, “I need time to relax. And then get into it. And then I take eight hours. And then I get lost in the world. And I feel all my characters.” And I don’t have that at all. Maybe I’ll get lost into it for ten minutes. And that’s thrilling. But I get a lot done. Bender: So it will be ten minutes. Boom. Productive. And then space out. Correspondent: Ninety minutes of thinking, thirty minutes of writing. Something like that? Bender: Yeah. And looking at old files. And rereading, rereading.